Students attend an off-campus programs fair on Thursday. With the Feb. 1 deadline to apply for many of next year’s off-campus programs rapidly approaching, students are weighing the benefits and disadvantages of studying abroad. Yet after just 535 students enrolled in off-campus programs in 2012-2013 — the latest year data is available — participation in off-campus programs has dropped 10 percent from the almost 600 students who studied abroad in 2008. “We’re not satisfied with the decline in enrollment. We’re working actively with departments to put these new programs in place,” said John Tansey, executive director of Dartmouth’s Frank J. Guarini Institute for International Education. Government professor Lisa Baldez said she recognizes that declining enrollments pose a problem. “It’s definitely something that the faculty have noticed. We’re thinking about creative ways to deal with it,” she said. While a handful of programs struggle with finding an adequate number of students to fill the trip, securing a spot on some study abroad programs still proves to be difficult. Spanish professor Raul Bueno noted that Spanish programs are particularly competitive. Not all new programs have faced these challenges as programs like the astronomy FSP in Cape Town and the film studies program in Los Angeles have attracted plenty of students, Tansey said. In addition to cancelled programs, the College does not offer a comprehensive foreign study program in economics — the school’s most popular major. Tansey noted that the economics department itself has not generated a plan for a study abroad. “Most of our programs originate out of departments. The economics department, they haven’t put forth a proposal or a strong interest in having an FSP or LSA,” Tansey said. Especially with the added tangle of the D-plan, studying abroad at some point in a student’s four years at the College can require extensive planning. Although cancelling a program may not seem particularly impactful, it can result in major shakeups to a student’s plans. In addition, with the College’s three-term language requirement, students must formulate a plan early on to fulfill it. “The LSA in German was a large part of why I chose to study German, to make it somewhat worthwhile by getting a cultural experience out of it and getting some semblance in fluency,” said Van Wetter. Jordan Kastrinsky ’16, who had hoped to attend the Arabic FSP that was cancelled last year, said he felt frustrated that he had to determine his own path to study abroad. His peers who study French or Chinese had enriching cultural experiences through the College, he said. 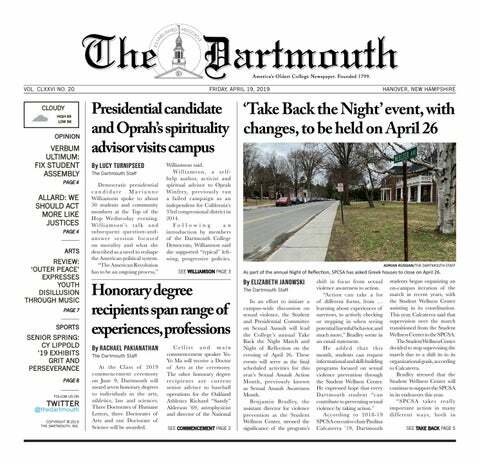 Besides the obvious inconvenience and frustration that program cancellations or a lack of a program to begin with can bring Dartmouth students, there are larger issues to consider when evaluating the effectiveness and efficiency of off-campus programs. Especially because of the Arab world’s centrality to global affairs, Kastrinsky said the cancelation felt like a particular slight. Still, few doubt the quality or success of many individual off-campus opportunities. Alex Kaye ’15, who traveled around the western United States on the earth sciences FSP, lauded the program. “It was absolutely unbelievable. It’s kind of amazing that they were even able to put it all together,” said Kaye. Sarah Waltcher ’16, who participated in the Spanish LSA in Buenos Aires last spring, said that the small size of the program allowed her to get to know her professors and peers well. While the Spanish department’s foreign study opportunities to Argentina are often competitive and receive more applicants than available spots for students, the LSA in the spring of 2014 only took nine students. Additionally, on-campus commitments and the rigid demands of certain fields can render it much more difficult for students who are studying science or are on the pre-med track to study abroad. There are far fewer opportunities to study abroad in these areas, and these majors and tracks have extremely stringent graduation requirements. Baldez speculated many students may feel that they’ve arrived on campus with sufficient global perspective and abroad experience. Van Wetter echoed Baldez’s concerns, noting that a younger generation may place less value on international learning. “In a broader perspective, maybe our generation doesn’t see abroad experiences as quite as vital,” said Van Wetter.